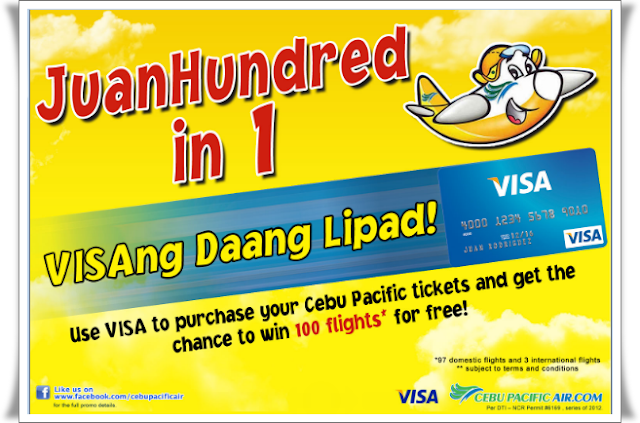 Cebu Pacific launches its partnership with VISA with the Juan Hundred Ways to Travel Promo yesterday, October 2, 2012. Cebu Pacific, the country’s largest national flag carrier has inked a 5-year partnership with VISA. The partnership would bring exclusive and exciting perks for Visa cardholders who frequently fly via Cebu Pacific. Candice Iyog, CEB VP for Marketing and Distribution, said "With Cebu Pacific’s new partnership with Visa, our guests can have more things to look forward to whenever they use their Visa card to book their Cebu Pacific flights. They’ll get to enjoy exclusive perks and even more irresistible travel deals". “Filipinos love to travel whether domestically to see extended family or for pleasure to see the world. That’s why we’re working with Cebu Pacific on this groundbreaking five-year alliance to make it easier for Filipinos to realize their passion for travel.The journey now starts with Cebu Pacific and Visa,” said Iain Jamieson, Visa Country Manager, Philippines and Guam. “Whether consumers choose to pay with their Visa credit, debit or prepaid card for their flights and holidays, we will be offering cardholders exclusive promotions, discounts and privileges whilst all the time benefiting from the convenience and security that comes from paying with Visa – and ultimately we hope to help Filipinos see more of the world with Cebu Pacific, for a lifetime of memories,” added Jamieson. Candice Iyog and Iain Jamieson pose for the ceremonial swipe during the launch. To kick off this partnership, Cebu Pacific and Visa will give one Visa cardholder a chance to win 100 flights for free to Cebu Pacific’s international and domestic destinations through the Juan Hundred and 1: VISAng Daang Lipad promo. The promo is open to all Visa cardholders, with ages 18 and above, who are currently residing in the Philippines. Visa cardholders who want to join the promo can simply “Like” the Cebu Pacific Facebook page (www.facebook.com/cebupacificair) to view the full mechanics of the promo. After liking the page, book a Cebu Pacific flight by clicking the “Book a flight now!” button. The participant will then be directed to the Cebu Pacific website, where he or she can book a flight using his or her Visa card, to qualify. A single Visa transaction for flight tickets amounting to at least one peso (PHP1.00) is equivalent to one raffle entry. The promotion applies to tickets purchases only through the website. This promo runs from October 3 to November 17, 2012. The grand raffle draw will be held on November 28, 2012. Want to be the JUAN to win 100 flights? Book your flight now using your VISA!